Three years ago an ascetic leader said his goodbye to this transient world and moved to his everlasting abode. Yes the same leader whose every moment in power was recorded as an act of valor. This ascetic king was the leader of Islamic Emirate of Afghanistan – Mullah Muhammad Umar Mujahid – who founded his state in pursuit of his Jihadi longings. His time in power however brief had a tremendously positive effect on the entire Muslim nation. It was during the reign of this Muslim leader that for the first time in the Islamic Afghanistan arrogant crusaders were apprehended for their undercover missionary activities, thrown in jails and their governments left begging the leadership of Islamic Emirate for their release. It was during his reign that the oppressed Muslims worldwide fled oppression to take refuge under his protective shield. It was during his reign that the delayed rulings of Shariah were again enforced and peace established in the mountain peaks and valleys of his domain affording an opportunity of rest and prosperity for its residents. It was during his reign that the governance system of Afghanistan became Islamic, its economic system Islamic, foreign policy Islamic and source for all rulings derived from the Holy Quran, Prophetic Traditions and Islamic Jurisprudence. It was due to this reason the western powers began viewing the kingdom of this Mujahid ascetic leader as danger for themselves and promptly summoned an array of crusader nations under the leadership of George W. Bush to invade the ‘Graveyard of Empires’. However this valiant leader offered the path of reason and logic to the arrogant Americans in place of force and stubbornness, an offer rejected by the conceited crusaders who invaded the Islamic land of Afghanistan only to find this Mujahid leader remaining firm in his Islamic stance. He declared Jihad against the crusading coalition with complete reliance in Allah and complete confidence in His divine victory. For 12 years – with astonishing bravery and under extreme circumstances – he led this historic resistance against world infidel powers. Such leadership the military tactics and maneuvers of which left the scholars of international military academies bewildered and military generals of NATO and the US overwhelmed. This leader led this miraculous resistance against international coalition of the crusaders from the dusty villages and mud compounds of his country. Throughout these 12 years of Jihad he not only dismissed the advanced enemy technology but was also insusceptible from their satellites. He was in contact with his Mujahideen 24 hours a day yet the enemy not only failed to identify his location but were never even aware of his communication channels established from the frontlines. Truly, Mullah Muhammad Umar Mujahid (may Allah have mercy on him) challenged the western concept of surveillance and advanced technology by adopting village level tactics. They (western world) not only failed in detecting his whereabouts but were also unable to secure their lives and interests from his Jihadi strikes. Allahu Akbar, who was this man, Mullah Umar Mujahid or Caliph Umar Khattab? A man who retaught us the meaning and essence of Tawhid!!! Come let us glance over what the some of the ideologues, scholars and political analysts of the Islamic world who commented about this giant of history on their twitter feeds following the announcement of his passing away by the Islamic Emirate. May Allah have mercy on the Imam, Mullah Umar. His example can rarely be found in our time. He established the law of Allah on earth, gave refuge to immigrants, accepted the advice of advisors and fought against the infidels up until he met certainty (death). I read through all the pages of history but could not find a leader like Mullah Umar who sacrificed his kingdom for the sake of sovereignty of the religion of Allah. May Allah have mercy on him and bestow upon him Jannatul Firdaws (highest paradise). The Islamic world lost a great Islamic leader with the passing away of Mullah Umar. A leader who waged a historic struggle against the international crusader coalition. O the leader of Islamic world! You truly were an Imam of the Muslim world such that the current and future generations of the Ummah and all their Jihadi and ideological movements and schools of jurisprudence shall follow your footsteps. O great teacher, have you really left us behind!? It is an Islamic matter that whosoever dies while stationed at the frontlines against the enemy is a martyr. 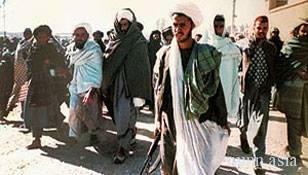 May Allah accept the martyrdom of the martyr Mullah Umar (Mujahid) and grant him Jannatul Firdaws.